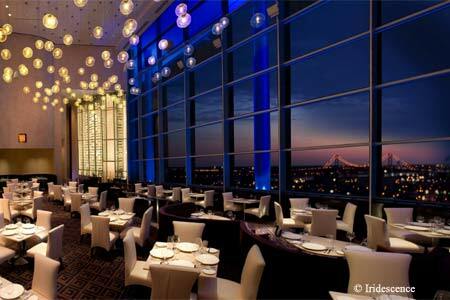 Sleekly sophisticated restaurant situated in the MotorCity Casino-Hotel. : Iridescence not only offers a sky-high view of Detroit's cityscape, it maximizes the luxe experience with an exhibition kitchen, revolving wine carousels, soaring ceilings and a feeling of old-world elegance mixed with cutting-edge urban modernity. We like the cioppino Thai-style with its scallops, nishiki risotto, shrimp, watercress, Prince Edward Island mussels and treviso; and the Atlantic Salmon via Southwest, a delight with salsa verde, polenta, cumin crema, avocado, black turtle beans, pepitas and cilantro. Or go big time with Châteaubriand comprising a 16-ounce grilled filet served with château potatoes, glazed root vegetables and béarnaise sauce. Want something totally unique? Try the seven-course American kaiseki menu. Finish with such desserts as the Key lime custard, coconut cream and roasted pineapple gelée, or the peanut butter ganache with caramelized bananas with vanilla bean ice cream. The wine list is extensive and includes by-the-glass selections. There's also a good range of Michigan craft beers. Be sure to stop by for the Sunday jazz brunch.